Many organizations are drawn to Internet telephony's promise of cost savings, and its ability to move data, images, and voice traffic over the same connection. Asterisk, an open source system than runs on Linux, offers the best option. This book covers installing, configuring, and integrating Asterisk with existing phone systems, without the need for additional hardware. It may be a while before Internet telephony with VoIP (Voice over Internet Protocol) reaches critical mass, but there's already tremendous movement in that direction. A lot of organizations are not only attracted to VoIP's promise of cost savings, but its ability to move data, images, and voice traffic over the same connection. A single Internet phone call can take information sharing to a whole new level. That's why many IT administrators and developers are actively looking to set up VoIP-based private telephone switching systems within the enterprise. The efficiency that network users can reach with it is almost mind-boggling. And cheap, if the system is built with open source software like Asterisk. There are commercial VoIP options out there, but many are expensive systems running old, complicated code on obsolete hardware. Asterisk runs on Linux and can interoperate with almost all standards-based telephony equipment. And users can program it to their liking. Asterisk's flexibility comes at a price, however: it's not a simple system to learn, and the documentation is lacking. Asterisk: The Future of Telephony solves that problem by offering a complete roadmap for installing, configuring, and integrating Asterisk with existing phone systems. This book walks readers through a basic dial plan step by step, and gives them enough working knowledge to set up a simple but complete system. The end results are largely up to the users. Asterisk embraces the concept of standards-compliance, but also gives users freedom to choose how to implement their system. 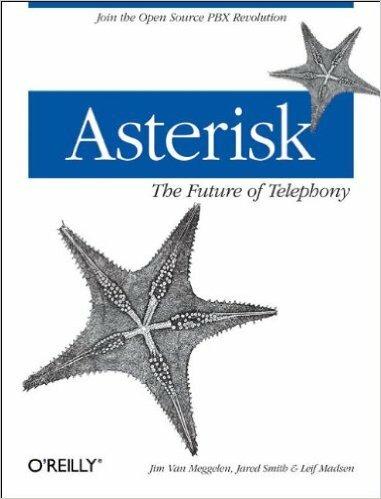 Asterisk: The Future of Telephony outlines all the options, and shows readers how to set up voicemail services, call conferencing, interactive voice response, call waiting, caller ID, and more. This book also teaches how Asterisk merges voice and data traffic seamlessly across disparate networks. And users won't need additional hardware, since Asterisk supports a number of hardware devices for interconnection with digital and analog telephone equipment. :) "... if you have the interest and time to spend, you will be rewarded in taking full control of your phone system and be able to expand that control to home automation and other functions limited only by your imagination and programming skill." :) "If you are looking to setup a bunch of extensions in your house, leverage the power of VoIP, add capacity to your legacy PBX at the office, or do something entirely new, then this book is an excellent starting place and resource."